While fjords are celebrated for their beauty, these ecosystems are also major carbon sinks that likely play an important role in the regulation of the planet’s climate, new research reveals. The finding is newly published in the international journal Nature Geoscience. After studying sediment data from worldwide fjord systems, the researchers, who include Dr Candida Savage of New Zealand’s University of Otago, estimate that about 18 million tonnes of organic carbon (OC) is buried in fjords each year, equivalent to 11% of annual marine carbon burial globally. Dr Savage and colleagues calculated that per unit area, fjord organic carbon burial rates are twice as large as the ocean average. “Therefore, even though they account for only 0.1% of the surface area of oceans globally, fjords act as hotspots for organic carbon burial,” Dr Savage says. Fjords are long, deep and narrow estuaries formed at high latitudes during glacial periods as advancing glaciers incise major valleys near the coast. They are found in North Western Europe, Greenland, North America, New Zealand, and Antarctica. As deep and often low oxygen marine environments, fjords provide stable sites for carbon-rich sediments to accumulate, Dr Savage says. Carbon burial is an important natural process that provides the largest carbon sink on the planet and influences atmospheric carbon dioxide (CO2) levels at multi-thousand-year time scales. In the Nature Geoscience article, the researchers suggest that fjords may play an especially important role as a driver of atmospheric CO2 levels during times when ice sheets are advancing or retreating. Earth is currently in an interglacial period after ice sheets receded around 11,700 years ago. During glacial retreats, fjords would trap and prevent large volumes of organic carbon flowing out to the continental shelf, where chemical processes would have caused CO2 to be produced, says Dr Savage. “In essence, fjords appear to act as a major temporary storage site for organic carbon in between glacial periods. This finding has important implications for improving our understanding of global carbon cycling and climate change,” she says. 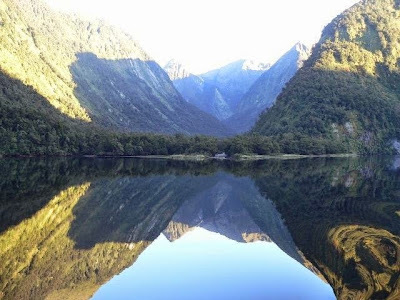 The research involved fieldwork in Fiordland and analysing data from 573 surface sediment samples and 124 sediment cores from fjords around the world.